Do not operate display functions during safety critical operations. Objects in the monitor are closer than they appear. The machineCam will not replace your eyes and ears. Please make sure that you are always monitoring critical operations directly. Do not expose the monitor to excessive heat or cold. The storage temperature of this device is -30~+80℃, and the operating temperature is -20~+70 ℃. The humidity is Rh90%. Never use this device near a bathtub, wash basin, kitchen, damp basement, swimming pool or similar places. Never use this device in environments with excessive moisture, dust or smoke. Avoid dropping or striking this device. Avoid using this device in enclosed spaces, areas with excessive vibration or subject to severe impacts. Never puncture, scratch or use abrasive cleaning materials on this device. Do not place cables where they may be pinched or stepped on. Leave at least a 2″ / 5 cm space between the monitor and walls, cabinets or other objects to allow adequate air circulation around the device. The monitor is not designed to be waterproof. The device may be powered by a 12 or 24 volt automotive battery or vehicle electrical system. Make sure all cables are connected properly. Observe polarity. Improper cable connections may damage the monitor. Remove the power cable connections when you do not intend to use the device. High voltage is present within the monitor. The opening of the case should be by professionals. Occasionally, a few highlights or dark spots may occur on the LCD screen. This is a very common phenomenon in active matrix display technology, and doesn’t necessarily indicate any defects or faults. Never try to repair this device by yourself. In case of any problems, please turn off the display at once and notify our company or authorized dealer. The monitor is a complex device. Any disassembly or modification may lead to damage and void the warranty. Remove all the cable connections from the monitor before cleaning the device. Use a mild household detergent and clean the unit with a slightly damp, soft cloth. Never use strong solvents such as thinner or benzine, as they might damage the finish of the device. 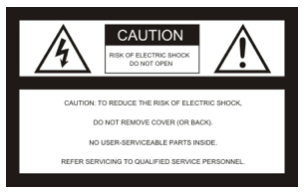 This symbol is intended to alert the user to the presence of uninsulated “dangerous voltage” within the product’s enclosure that may be of sufficient magnitude to constitute risk of electric shock to persons. This symbol is intended to alert the user to the presence of important operating and maintenance (servicing) instructions in the literature accompanying the appliance.